from the blue chair: Done! I finished my last Christmas projects yesterday. I made a pile of potholders for a few close neighbors and Miss C's preschool teachers. 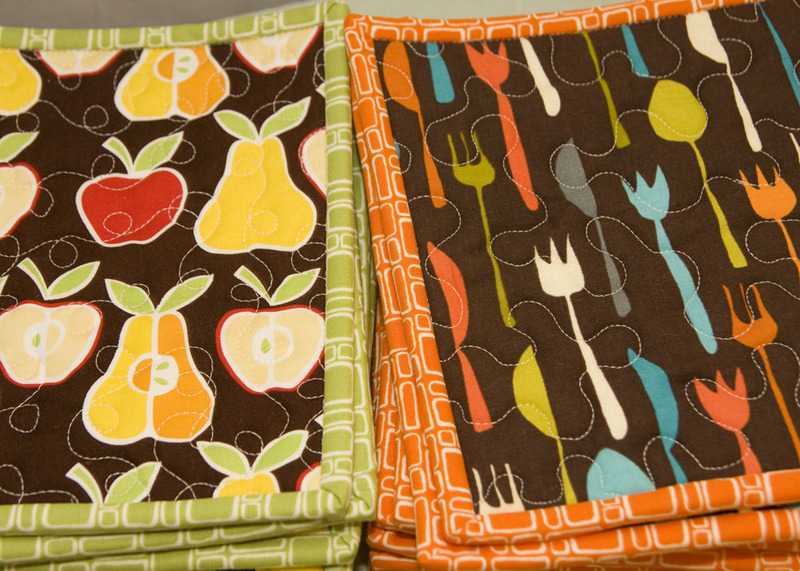 I didn't do anything fancy--just some cute kitchen fabric. I plan to give one of each to those on our list. After I had them all almost finished, I realized other people might not share my love of the color orange. I hope they like them. I also finished wrapping all the presents last night. We will do a quick grocery trip on Wednesday for a few things, but that's it. It's so nice to be done. My husband is extremely hard to buy for. He is pretty specific in his interests and hobbies, and I don't even try to get him gifts in those categories. Gifts for him are generally useful, but there is one gift I always give him that isn't clothes or something else useful--a Dilbert Desk Calendar. He relates to Dilbert and always enjoys the comics. I hate being horribly obvious in my purchase of this item, so this year I bought it from Amazon rather than the Calendar Club in the mall. The other night I asked the hubs to get the mail. He came inside with his calendar and a mangled box. It seems the mailman was too busy to just drop the box by our step so he shoved that thing into our lock box so tight that it was impossible to get out from our side of the box. My husband had to open the package inside our box to get everything out. He came inside a bit sheepishly and showed me what happened. He then proceeded to tell me that he already knew I had ordered it because Amazon makes recommendations based on what you just purchased. He happened to notice what I had been browsing for. I knew this. Why didn't I think of that? Stupid mailman! Stupid Amazon! So much for Christmas surprises. I still wrapped it up even though it's not a surprise at all. I love the potholders! I'm sure the teachers and neighbors will too. And don't feel bad about your gift for your hubby. I can't find the gift for mine. Apparently I hid it from myself. So at the moment, he's getting nothing! I haven't even started wrapping. I really don't like that so I procrastinate. I think the pot holders are adorable! Super cute!! I love the potholders! Great fun colors. I am so not done. Not even close. I have the same kinds of problems with my hubby's gifts. Cute, cute potholders. I'm sure everyone will love them! I love these potholders! I really need to make some new ones for my kitchen. Bummer about your husband's gift. I'm lame and didn't even get my husband anything this year (although we did decide that we would just get gifts for our kids this year). But, we did decide that we're going to keep a running list of items we'd like to receive on our computer somewhere so when we need to get a gift for each other, we can pick from the list and have a little bit of secrecy and surprise. I finished making my last gift Sunday night and got all the kids' gifts wrapped last night. Now I just have to take photos of the handmade items and wrap those and I'm good to go. Congrats! As usual I am no where near ready for Christmas! Have a wonderful time with your family! I'm sure everyone will love your potholders! LOL - you should leave a nasty note for the mailman. He will love it and your pot-holders are SUPER cute! Those potholders are adorable!! I'm laughing about your lack of surprises for your husband. I have the same problem here. I was very careful, very thoughtful, and I thought very sneaky... and he has guessed all of them with them exception of chocolate covered pretzels. Sigh. So, I decided I am going to write him a love letter or poem to tell him just how wonderful I think he is... he won't see it coming a mile away! Being all set and ready to celebrate is a great feeling isn't it!!! That's awful about your mailman's mangling of your husband's gift! Argh, I'd definitely be grumpy. My husband's really tricky to shop for too, so I know I'd be upset if the surprise got ruined! The potholders you made are adorable and I love the fabrics you chose! I love making pot holders they are so quick. 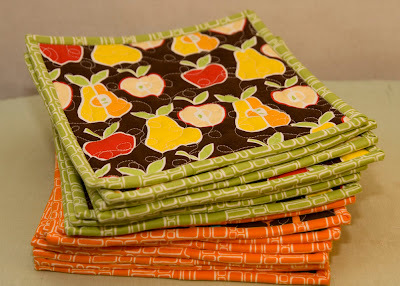 I love the green and orange you used for the binding. Too bad about the mailman, I would hate that job this time of year, maybe he does too. Love the pot holders, love the color orange, and love the story about your husband - Thanks for a laugh!